This week in New York there will be an event not to be missed on November 16 at 5:30 p.m. at Christ the King High School in Queens. The Italian Consulate is sponsoring a free public concert which will introduce the U.S. to Fabrizio De Andrè, the great Italian artist who passed away nearly ten years ago. 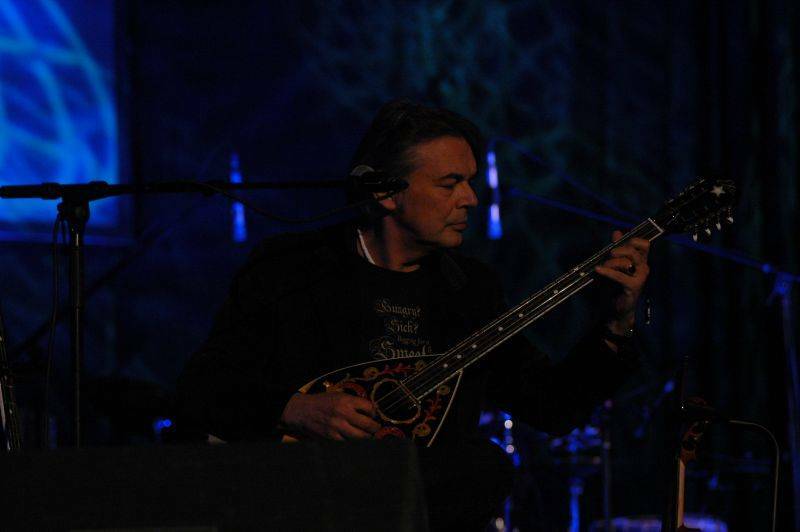 His music will be interpreted by Mauro Pagani, De Andrè’s friend and musical collaborator who is also a versatile musician in his own right, capable of playing everything from 70s rock to folk and ethnic music. Pagani, a founding member of Premiata Forneria Marconi, the legendary Italian group of the 70s, has worked with many famous names in Italian music in addition to De Andrè, the celebrated Genovese singer-song-writer. Since his career debut in 1958, De Andrè has revealed himself to be an artist focused on going deeper to discover the essence of human reality often made of sadness, fragility, and mystery. Through his ballads suspended between myth and realty, he revolutionized the canon of traditional Italian songs. De Andrè’s world was always populated by those who were cast out – derelicts, prostitutes, and lost souls. They were all losers who were fighting an unfair battle against the arrogant, the powerful, the self-righteous, and the Pharisees. His music was inspired by medieval ballads, but also by songs of Sardinian shepherds, Baudelaire, and many others. His described his universe in ironic terms, laid everything bare, and went against all conventions. Mario Luzi, one of the greater Italian poets of the twentieth century, said: “De Andrè is really the singer-song-writer par excellence, an artist who realized the inter-relationship between literary and musical texts. His music tells a story and it digs deep.” In fact, his music continued to evolve, stretching out in different directions, searching for and experimenting with the new while and never yielding to the whims of fashion. My first meeting with Fabrizio De Andrè goes back to 1970; it was fleeting and absolutely by chance. I had just joined a group of talented musicians, and a few months later we started P. F. M. At that time we frequently worked in shifts as studio musicians. It was actually in those days in 1970 when I went to find them in Recordi’s studio where they had been called to work on the recording sessions for Fabrizio’s album La Buona Novella. It was a short meeting with few words, but at the same time it was the beginning of a relationship that would develop over the years. We practically did not meet again until 1981 when we again met by chance in a recording studio. This time it was in Carimate’s Stone Castle Studios where he was recording L’ Indiano and I was recording the soundtrack for Gabriele Salvatores’ first film Sogno di una notte d’estate (A Midsummer Night’s Dream) based on the comedy by William Shakespeare. On that occasion he invited me to play on his tours: and so a relationship that was destined to last 14 years was born! In 1984, De Andrè threw himself into an original project that surprised the Italian music scene: Creuza de ma. It was an album which became a cornerstone in Italian music, born out of his collaboration with Mauro Pagani. Written completely in the Genovese dialect, “the neo-Latin language rich with Arabic sounds,” it is De Andrè’s tribute to “his” Genoa. He envisioned it as a sort of microcosm with the “flavor of Genoa’s sea, the aroma of its kitchen, but also the stench of its port and the rotten fish.” It is a Genoa that has “the face of the outcasts in the old city, the ‘charms’ of Via del Campo, the ‘flowers that bloom from manure.’” With this album De Andrè journeyed through clear and unforgettable images accompanied by typically Mediterranean sounds with traditional North African, Greek, and Provençal instruments, from the Macedonian gaida to the Andalusian guitar, from the Turkish shannaj to the Arabic lute, all melded with electric instruments. It is an unforgettable album which was critically acclaimed as the best album of the year and of the decade. I asked Pagani the obvious question: When did you realize that Creuza de ma represented a cornerstone in Italian music? At least a couple of years after its release, with respect to its incredible critical success and the astonishing number of awards and recognitions that it received. What is Fabrizio De Andrè’s artistic and cultural legacy? His ability to recount dreams with unparalleled grace and lightness, the contradictions and the profound qualities of ordinary people without making them banal or passing judgment. In 2004 you created a sequel for the twentieth anniversary release of Creuza de ma. How did this idea come about? In 1984 when we finished the album, we had the confidence and the justifiable aspiration to be a part of that wonderful and boundless cultural basin that is the Mediterranean. For years we had listened to Turkish, Greek, North African music, we devoured its poetry and we shared our aspirations. But in reality we had very few relationships or close friendships with musicians coming from that geographic area. Therefore, we were compelled to make a record that was less than a real journey and more of a dream, a sort of romantic affair where everything was imagined and sketched in pencil on the basis of listening and reading. Twenty years later it seemed to me that the time had arrived to transform that dream into a true journey, populated with real not invented characters, with voices and percussionists of the Maghreb, and Turkish and Persian clarinet players. January 11, 2009 will mark the tenth anniversary of Fabrizio De Andrè’s passing. Over the years were there moments in which you truly felt his absence? Through 14 years of working daily side-by-side, you become friends, accomplices, and companions on the journey. So when a friend passes on, you miss him every day in some way, you miss his remarks, his intelligence, and his affection. In Milan you opened the “Officine Meccaniche” (The Machine Shops), a new label as well as a recording studio that within a few years also became a meeting place for musicians. How do you see the future of Italian music in our society that is increasingly more multicultural? I wait and dream that Italian music will become more “Italian” – with an identity and a strong and unmistakable sound, one that relies less on foreign productions and at the same time reaches such a level of professionalism that it is able to compete and claim a permanent place in the world market. Because “contamination” breeds novelty and not necessarily bad copying, it is important to have the curiosity, the courage, and the personality of someone who has much to offer and not only wants to take. And so it is an event not to be missed: a proper tribute to the exceptional artist Fabrizio De Andrè and a journey through his immortal music that will enchant New York with the sounds and moods skillfully recreated by the great Mauro Pagani. Sunday's concert will be preceded by a preview to be held on November 14, 6 p.m. at the Italian Cultural Institute (686 Park Avenue, NYC).